Where You're Not Just a Customer…You're Family! Join us in raising funds for Good Samaritan’s Breast Health Center and for Making Strides Against Breast Cancer. We will be making and selling pink cupcakes for $1 all month and 100% of every dollar goes charity. 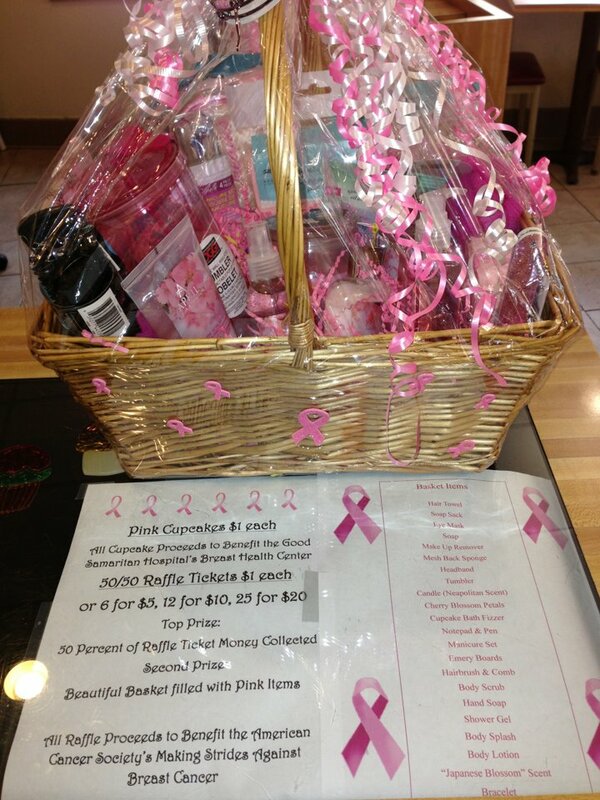 We are also doing a 50/50 raffle with first prize winning 50% of the money collected and second prize winning this beautiful pink basket donated by Lyn and Jerry Humston. The other 50% of the money collected will be donated to charity as well. So next time you stop in for breakfast, or broaster chicken, or meatloaf, or a gyro grab a pink cupcake for dessert and try your luck with a raffle ticket. Thursday is Greek Day at George’s! Come and try one of our Gyros or a piece of Spinach Pie. You can make your own pita sandwiches with our Greek Hot Plate-chicken, gyro meat, pork souvlaki, feta cheese, vegetables and tzatziki sauce…Yum! You can click here now to download our current menu, Join us on twitter for daily specials!